Prophetic events are important to understand in order to appreciate the power of God to control all earthly circumstances to accord with his divine plan formulated before the foundation of the earth. Those events can be comprehended if two essential factors are applied. One involves chronology (the time the events take place) and the other is geography (the places where the events will occur). In this Prophetic Report we will concentrate on the geographical indications — where the prophetic occurrences for the End-Time will happen. There are four types of geographical indications found in the Bible to describe the places where End-Time events are to be fulfilled. The first is the use of very old geographical terms associated with the places that the initial patriarchs went after the dispersal of the human race in the wake of the rebellion of mankind at the Tower of Babel. These early terms were in vogue from the 22nd century to the 15th century B.C.E. The second pertains to new geographical terms for various peoples after the development of nations when the Exodus of Israel from Egypt took place in the 15th century B.C.E. This phase lasted until the Babylonian Captivity in the 6th century B.C.E. The third applies to geographical terms of empires or of their subject peoples who developed within their empires after the Babylonian Captivity of the Jews (from the 6th century B.C.E. to the close of the Old Testament canon in the time of Alexander the Great). We will discuss these four types of geographical indications mentioned in the Bible. It should be mentioned that all of the basic information in this Prophetic Report comes solely from the Bible. I do provide some historical connections with proper references, but this research primarily involves only biblical information. 1 But we should all look at the Holy Scriptures first in these matters. After all, it is God (and his divine word) who has the final say on all prophetic events. With the teaching of God being given first, we can be properly led in looking at the historical evidences in determining what the truth really is. This map deals with geographical terms linked to the first period in human history after the Flood of Noah. That was the time from the dispersal after the rebellion at the Tower of Babel until the Exodus of Egypt by the Israelites. Look at this outline map of the world and you will see that some of the areas first colonized by the few patriarchs mentioned in Genesis Ten are still being called by those patriarchal names in biblical prophetic contexts even at this End of the Age. For example, in the Book of Revelation, the people of MAGOG are shown as inhabiting regions in the extremities of the earth from the area of the Middle East. It mentions the people of MAGOG as being located in the four quarters of the earth. 2 To people in the 1st century this meant MAGOG was inhabiting areas in the antipodes of the earth (a term which would embrace both the American continents today). His son TOGARMAH settled our modern Spain and Portugal and the western half of North America. The people of KITTIM went to Italy, parts of Asia Minor and Cyprus. ELISHAH took over western Asia Minor and most of Greece. DODANIM (which in other biblical contexts is called RODANIM) inhabited the island of Rhodes and other adjacent regions. Most Bible dictionaries or encyclopaedias will confirm these basic geographical indications to even the casual investigator. That does not end the matter, however. If you will notice map “B” (below) it is shown in a general way that Shemite tribes (people who were descendants of Shem and including some peoples who came from Abraham) later colonized the whole of southern Europe and replaced the people of JAVAN and his four descendants. JAVAN’S people were pushed mainly into the northern areas of Europe where in turn they migrated farther east into Asia (along with GOMER the firstborn son of JAPHETH and his descendants). Indeed, in prophecies dealing also with the End-Time, we find the people of JAVAN no longer in Europe but they are now associated with TUBAL (another son of JAPHETH) who became an eastern Mongolian type of people. So far from Israel did JAVAN finally migrate that the prophet Isaiah said they came to know nothing about the God of Israel (Isaiah 66:19). If this were a reference to JAVAN in Europe (where they first settled), it would make no sense because most southern Europeans since the Exodus of Israel from Egypt were well aware of the practices of the God of Israel. The JAVAN whom Isaiah was speaking about was now aligned with TUBAL (a Mongolian people). Even in Ezekiel 27:13 and 19 we also find Ezekiel no longer associating the people of JAVAN with Europeans — the people of JAVAN had long left the area (though the name JAVAN still retained its geographical hold on the southern region of Europe, particularly in Greece). But Ezekiel in his day was now placing the people of JAVAN (along with Isaiah) with the mongoloid peoples of TUBAL. The people of JAVAN later take their name even further into the southeast Asian area of Indonesia where many modern people are called JAVANESE. It is not uncommon for people to give a name to a region and then the original people move on to other areas or are killed off. The original geographical name then becomes associated with completely different people. 4 Thus, Shemitic peoples (and others) took over the areas of JAVAN in Europe (with his four descendants named ELISHAH, RODANIM, KITTIM, and TARSHISH). The same thing has occurred to the people of MAGOG in the Americas. People from Europe and Africa have come into the original territory colonized at first by MAGOG and now the MAGOG people in North America have become a minority group. In fact, as map “B” shows, not only did the people of TARSHISH (a son of JAVAN) establish themselves at first in what we call Spain and the western part of North America, another group must have journeyed eastward into the tropical areas of Asia. In II Chronicles 20:36 it is recorded that Jehoshaphat, king of Judah, joined himself with Ahaziah, king of Israel, “to make ships in Ezion-geber to go to Tarshish.” This was at Ellat on the Red Sea. These ships to Tarshish were in the Indian Ocean and they sailed to the same areas where Solomon fetched “gold, silver, ivory, and apes and peacocks” (2 Chronicles 9:21). And while the people of TARSHISH who first settled the western parts of the Mediterranean were finally replaced by Shemitic peoples (basically) from the Levant, Asia Minor and Mesopotamia, the eastern branch of TARSHISH remained active in later times in East Asia. And too, GOMER (the firstborn of JAPHETH) was the first to settle central Europe, but at the End of the Age we find his descendants in Asia — in the Far East. In Ezekiel 38:1–6 we find GOMER associated with MAGOG, MESHECH, TUBAL, PERSIA, ETHIOPIA (eastern CUSH, of the Hindu KUSH), PHUT in India and Ceylon (not as the KJV states as Libya). This means that GOMER and all his bands long ago became Asiatic powers, and they are still Asiatic powers at the End-Time. After the Millennium is over, we have the Book of Revelation referring to the earliest geographical regions associated with MAGOG — the four extremities of the earth which primarily refer to the regions of the antipodes (the North and South American continents, Southern America and extreme northern regions of Eurasia). 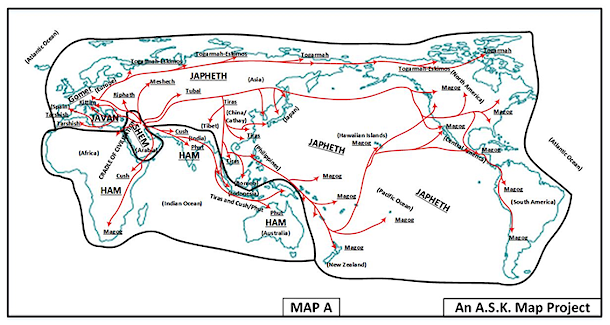 What must be understood is that most of the European tribes of JAPHETH left the region and went into Asia (and a small band to South America who gave rise to the Hottentots) and further eastward into the Pacific Islands and then the Americas. The Americas were at first colonized from the west (mainly via the Pacific Ocean) with people using small boats and not from Europe and Africa. In the period covered by map “A” (from the dispersal at the Tower of Babel to the Exodus of Israel from Egypt), the people involved in the migrations were just small family groups hardly numbering more than a hundred people or so. Though the people of JAVAN and GOMER did at first settle southern and central Europe and gave their names to the regions (which in some instances still persist to this day), it was just roving bands of a few people who did this name-giving. It was characteristic of this period for “nations of people” to be made up only of a few families banded together. Note that in Abraham’s day when the four “nations” came south from Asia Minor and Mesopotamia to invade the cities of the plain (Sodom and Gomorrah), Abraham was able to conquer all four nations near the area that later became known as “Dan” with a mere 318 troops (Genesis 14:14). Indeed, the city of Sodom was so small at the time that all the men of the city showed up to do malice to two angels whom they thought were men (Genesis 19:4). When all the men of the city of Shechem in the time of Jacob were recovering from circumcision, only two sons of Jacob (who had no such affliction) were able to kill every male in this “major” city (Genesis 34:25). When David wrote a “History of the World” in a series of Psalms (Psalm 103:19 through to the end of Psalm 106) that described historical events from before the creation of the world until his own time, David stated that in Abraham’s day when Abraham was an important man in the eyes of nations and kings (and the texts show “nations” and “kingdoms” in existence), the populations involved are best described as being “few men in number; yea, very few” (Psalm 105:12–13). And though I am guessing regarding the exact figure, in the time of Abraham the biblical texts indicate there were probably fewer than 20,000 human beings scattered over the whole earth. Following the Tower of Babel rebellion, these early movements of peoples into all areas of the world at the dispersal, were made with just a handful of individuals. There were as yet no races of people as we know them today. It took time for the various races to appear from the eight people who came through the Flood. In the animal world it takes about eight to ten generations to create a new breed (say of a dog), and in God’s own way, God caused new “breeds” of humans by placing small groups of people in various isolated areas of the world to develop into the racial types of people we see on earth today. God indicates that ten generations can apply to one type of people before they become like another type (e.g. Deuteronomy 23:3). By the time of the Exodus (about ten generations from the time of the dispersal at the Tower of Babel) we know that racial types had then come into existence because Israel came out of Egypt with a “mixed multitude” in their midst (Exodus 12:38). All races on earth today are assigned their areas of influence by God himself though humans are all of one blood to one another (Acts 17:26). In dispersing the nations around the world, God was able to help the first settlers to navigate to their assigned locations on earth. Map “A” gives a rough overview of this movement of these small bands of peoples into their areas of the world. These were groups of people (very few in number). True, they gave their names to the geographical areas to which they first went (and in some prophetic texts those names are still applied to the peoples who live there when the End-Time prophecies are fulfilled), but in most cases the few people of JAVAN and GOMER who first colonized Europe, were driven northward and eastward when the second phase of migration set in at the time of the Exodus of Israel. It is important to recognize that the descendants of JAVAN and GOMER left the European areas and went far away into most of the areas of Asia (China, Japan, Southeast Asia, Indonesia — and about 2000 years ago a group from Indonesia went to Madagascar off the Southern African coast). We must understand that the word “JAPHETH” itself, who was the patriarch who gave rise to these peoples, means “enlargement.” The JAPHETIC peoples were to be the largest group of the human race in numbers and were to settle finally in the larger areas of the earth away from the Middle East. The Bible shows that during the time Israel was in Egypt there was a population explosion among the settled peoples of the Middle East. The Israelites grew great in numbers, but so did those in Canaan and elsewhere in the Middle East. Recall that (even with their numbers) the Israelites were still afraid to attack the peoples in the Land of Canaan because their populations also increased. When the Israelites set out for Canaan to possess the land from its first inhabitants, this set off a chain of events that led to numerous peoples from Canaan, Asia Minor and Mesopotamia leaving those areas and going into the regions of North America and southern and northern Europe. This movement of peoples (which happened over several generations and centuries, I am giving simply an overview in map “B”) were made up of vast numbers of peoples in a relative sense and they changed the racial make-up of the various regions of Europe into which they went and settled. Many of these newcomers were from Abrahamic stock. The apostle Paul said that the Romans to whom he was writing (though they were uncircumcised Gentiles) were nonetheless people who had Abraham as their father through the flesh (Romans 4:1). 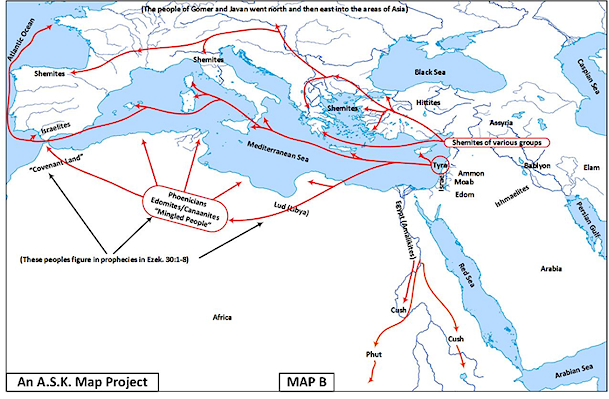 During the period covered by map “B” there were many intrusions of Shemitic peoples into Europe and into the fertile areas of North Africa along the Mediterranean Sea. The main bulk of the Phoenicians (which means “Ruddy People”) were of Edomite stock. The word “Edom” also means “Ruddy.” The Edomites were close kin to Israelites since Edom was the twin brother to Jacob. 8 They established a network of mercantile routes (both sea and land) throughout the Eurasian and North African areas which made them the envy of the world for the thousand years from the Exodus to the Babylonian Captivity. It was mainly in the time of Solomon that the Phoenicians and the mercantile guilds controlled by Solomon made intrusions of trade and settlements in many Eurasian and African areas. While this was going on in the “Old World,” no major settlements were made in North and South America by these people. It was not necessary. All the gold, silver, animals, and exotic plants that Solomon was interested in were found in abundance in the Eurasian and African continents. While there were no doubt occasional links between Europe and the Americas in the time of Solomon and in other periods, there were no active settlements of peoples made by these Shemitic and/or other European or North African peoples in the thousand years between the Exodus and the Babylonian Captivity of the Jews. Indeed, in Persian, Greek, Roman, and even in the early Islamic periods, there may have been an occasional contact by ship between Europeans and peoples of the Americas, but there were no settlements of these people. There were no doubt trans-Pacific migrations took place, but not large scale transatlantic European migrations or colonizations. The evidence has to do with domesticated animals and diseases. The fact that Shemites (and the later peoples of Europe) were always great lovers of animals and domesticated scores of animal types for the use of mankind (goats, sheep, cattle, horses) is almost a certain guide to show that the New World (before the time of Columbus) was not visited extensively or certainly not settled by European or North African peoples who almost always took their animals with them in their settlements. People who are used to domesticated animals always want them in their midst to supply them with special foods that the animals produce, clothing, work, power and/or companionship. When people colonize new areas of the globe, they almost always take their domesticated animals with them to their new areas of settlement. In the Americas, however, the only real domesticated animals (and this is even debated) were the dog and turkeys. When Europeans who had long lived with their domesticated animals (and inherited many diseases associated with them) first began to settle the New World in the early 16th century, the native peoples who had not lived intimately with animals in their midst, died off at a prodigious rate. The same thing happened to other peoples in the world who mainly made their living by hunting wild animals and/or did not live with the animals if they were domesticated. This allowed such people to be free from the many diseases that came from microbes that had their origin with domesticated animals which were abused by man or became sickly but still consumed by man. Of course, there is nothing wrong with having domesticated animals as long as man uses them correctly and not in ways that God condemns and utterly forbids. The wild animals in the Americas were less likely to be misused by people than those that mankind in the “Old World” domesticated. Animals can be very dangerous to humans if they are misused or not governed correctly. Whereas Noah had separate rooms in the Ark for animals and humans (Genesis 6:14) to avoid cramped and unsanitary contact between humans and animals, our early European colonizers often forgot this example of Noah concerning the separation of animals from humans. When the first Europeans brought their animals to settle in the New World, they ate, slept and conducted their aboard ship living in close association with their animals. Such conditions of even a few weeks duration produced some of the most disease generating environments that one could imagine (with rats, animals and humans all living together without proper sanitary facilities). Indeed, many people and animals were already sick when they stepped ashore in their new homelands and they spread their animal engendered diseases among the natives (who did not have domesticated animals and were not used to them) and wiped out whole tribes of peoples because of such diseases. Actually, such conditions could even cause new diseases to develop (or for old ones to be revived) because of wrong contacts with animals. The first inhabitants of the Americas after the rebellion of the Tower of Babel did not bring their domestic animals with them in their small boats. This spared them from many contagious diseases that too close contact with animals (in an unsupervised way) can bring about. The fact that the New World was free of many animal generated diseases before the time of Columbus is evidence that people with domesticated animals on board bigger ships did not make settlements in the New World until about 500 years ago. In Daniel 7:12 and 17 it states that some of these nations will make a re-appearance at the End of the Age (in our time today). 10 As a matter of fact, since the First World War, nations have again appeared on the scene but they have boundaries that do not resemble any of the earlier nations which many of the prophecies mention. 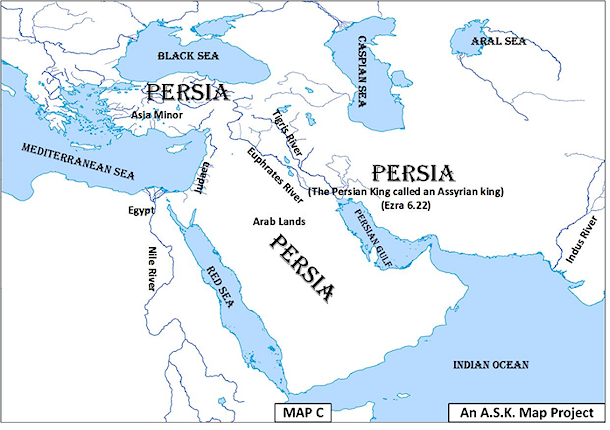 Prophecies made at the beginning of this period shown on map “C” are still concerned with areas in the Middle East, but just as Persia embraced a multitude of nations within its empire, so nations today may not perfectly fit the modern geographical boundaries which modern man has imposed on the region of the Middle East. When End-Time prophecies refer to the early lands of “Babylon,” “Moab, Ammon and Edom” (to name a few), they still refer to the geographical areas that the prophets were able to view when the prophecies were first given, no matter what modern race or culture of people now reside in the lands. This map is perhaps the most important to understand in regard to prophetic matters for the last seven years of this age, just before the Second Advent of Christ back to this earth. This map shows what the “Promised Land” that was first given to Abraham, Isaac, and Jacob really encompasses. It shows what King David was inspired to disclose about the boundaries of the “Promised Land.” Most people do not realize that the biblical commands of God actually make the “Promised Land” a lot bigger than people have been led to believe. It actually includes all of Kuwait, Saudi Arabia, Jordan, most of Syria and all of Lebanon as well as the Sinai Peninsula and all the land bordering the central and southern parts of the Suez Canal. The enhanced dark line circling the Arabian peninsula and the adjacent lands in the north and west as shown on map “D,” delineates the real “Land of promise” (which is called in Daniel 11:16, 41, and 45 the “glorious” land). In the time of Solomon, Israel controlled all the land that is shown within that enhanced boundary. While the nations of Edom, Moab, Ammon, Tyre, Sidon, Damascus and all the region of the Arabian tribes of the Arabian peninsula are allowed by God to live in this area of the “Promised Land” and to be treated as “homeborn” people with all the rights of Israelites (Ezekiel 47:22–23), the land is still acknowledged by biblical teaching as destined to be under the control of Israel’s messianic king. This is the real “Promised Land” of Abraham, Isaac, Jacob, and King David. Let us now look at the biblical verses that prove this. First notice Genesis 15:18. God said to Abraham: “Unto your seed have I given this land, from the river [Hebrew: nahar] of Egypt unto the great river, the river Euphrates.” There can be no doubt that the word nahar means a real river that normally flows all year round. It could only refer to the Nile, and this is how most people (including Jewish religious leaders) have interpreted it. It is even said that the present Israeli flag with two blue stripes (one at the top and one at the bottom with the Star of David in the center) denotes the River Euphrates in the north and the Nile in the south. Certainly, the Nile was intended by Isaiah, and the extreme eastern branch of the Nile (the Pelusaic, which has now dried up, Isaiah 19:5) is the one that was the border of the Land of Promise. Indeed, the Pelusaic branch was only a small stream and this is why the Euphrates in Genesis 15:18 was called “the great river” in contrast to it. Thus, it is clear that the western boundary of the Land of Promise was the point where the Pelusaic branch of the Nile entered the Mediterranean. When one proceeds south from that western point on the Mediterranean, one would soon leave the Pelusaic branch of the Nile and head in the direction of the Red Sea. It is at this point that a further geographical term came to be used to designate the western limits of the Promised Land. It was the “Valley [Hebrew: nachal] of Egypt.” And true enough, just south of this former eastern branch of the Nile is a valley which heads directly toward the Red Sea (to the city of Suez today). This is the valley area (with a few lakes in it) that was called the “Valley of Egypt” and it represented the border between civilized Egypt of the past and the desert regions to the east. This valley today occupies most of what we call the Isthmus of Suez and it is clearly the celebrated “Valley of Egypt” (i.e., Egypt’s Valley) referred to in the Bible (e.g., Joshua 15:4, et al.) that was Israel’s western boundary in a geographical sense. In no way was the Wadi El-Arish some 90 miles east toward Palestine meant as the “Valley of Egypt,” though the LXX Greek translation of Isaiah 27:12 has it that way (no doubt because of political reasons in the 3rd century B.C.E.). Josephus knew better than this. He showed the area of El-Arish as belonging to Judah (Antiquities 13.395) and Jerome even said the “Valley of Egypt” was west of El-Arish towards the eastern arm of the Nile. Without doubt, the “Valley of Egypt” which represents Israel’s western border is the valley within which the present southern two thirds of the Suez Canal traverses to the Red Sea. With this being the case, the Red Sea southward becomes the southwestern border of Israel. This means that all of the Sinai Peninsula is included in the Promised Land. But there are other boundaries to consider that show the full extent of the actual Promised Land. In the north the River Euphrates is clearly defined as the boundary, and we are further told in Ezekiel 47:17 that the city of Hamath on the Mediterranean Sea was also its north border. One can draw a line from Hamath to the River Euphrates for the position of the extreme north border. But then one should follow the River Euphrates southeastward until it reaches the Persian Gulf for the northeastern border of the Promised Land. As a matter of fact, Ezekiel showed his ideal “Land of Promise” (as it will exist in the Millennium) as having its new Temple centered at Shiloh in Ephraim. This was to fulfill the promise given to Jacob that the Messiah will go to Shiloh to establish his Temple (Genesis 49:10), not that a person named “Shiloh” will arise in Judah. Ezekiel shows that the city of Jerusalem will still exist as the capital and it will be a square city located in the same area as now. But the sanctuary region in the Millennium (which is a squared region with boundaries about 60 miles in length on each of its four sides) will stretch eastward from its central location at Shiloh for about 30 miles. This means that the sanctuary area has expanded some 15 miles east of the Jordan River. Ezekiel then draws a line from the north (from the Euphrates) to Israel’s southern border to intersect with the point 15 miles east of the Jordan. The line of Ezekiel starts southward from the Euphrates to Damascus, then to Gilead east of the Jordan River, and then through the border areas of the Trans-Jordanian tribes. From this eastern line (some 15 miles east of the Jordan River), Ezekiel 47:18 then records that one should measure “unto the east sea.” This is clearly, again, the Persian Gulf. This means that from the River Euphrates east of Hamath unto the Persian Gulf one should go south from the River Euphrates until the land ends — until one reaches the ocean. In this case, David meant the Indian Ocean. This clearly shows that all of the Arabian Peninsula is in the Promised Land! Indeed, when one proceeds southward from the River Euphrates in this eastern region, one meets with the Arabian’ desert where all the oil at the present happens to be. And what does David go on to say? 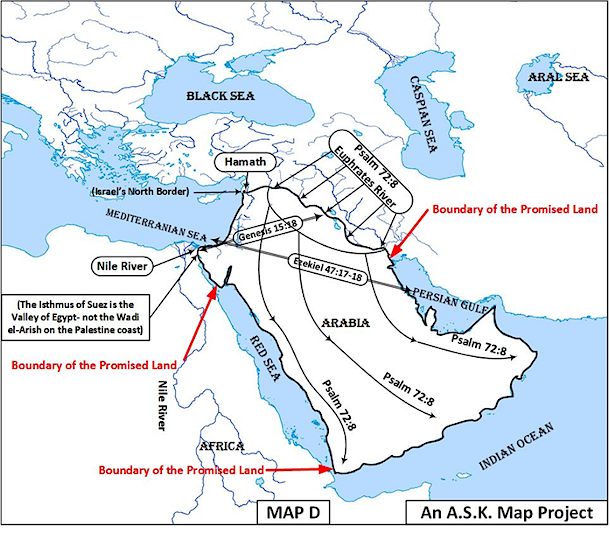 In the very next verse (Psalm 72:9) he relates that because of this direction in showing the Promised Land “they that dwell in the wilderness [the desert region of Arabia] shall bow before him; and his enemies shall lick the dust.” Yes, all of Arabia is also reckoned to be in the Promised Land. Most people, even prophetic interpreters, do not realize how extensive the Bible shows the Promised Land to be. Some are willing to take it from the River Nile to the Euphrates and then eastward to include the region of Gilead where the Trans-Jordanian tribes of Israel settled at the time of the Exodus, but to stretch out its dimensions to include all of the Arabian Peninsula has hardly been realized by most Gentile commentators on the Bible. However, in Israel itself one can read (though it is all in Hebrew) the Atlas of the Land of Israel — Its Boundaries According to the Sources, published by Cana Publishing House in Jerusalem. All of the above is shown quite adequately. In this Atlas one will note that the southern boundary from the top of the Red Sea towards the east to the Persian Gulf is sometimes given as a dotted line, but the map on page 62 of the Atlas that gives the dimensions of the land found in Psalm 72:8 and Ezekiel 47:17–18, forces the mapmakers to place the southern boundary of the Promised Land far to the south of the dotted line. In a word, Psalm 72:8 takes the southern boundary to the Indian Ocean, as I show on “Map D” above. It embraces all of the Arabian Peninsula. Thus, when one wishes to interpret the prophecies of the “Book of Truth” given in chapters 11 and 12 of Daniel, one should consider that what Daniel calls the “glorious” land (Daniel 11:16, 41, and 45), may well be a much larger territory than many interpreters believe. This is the land that the Antichrist (called the Vile Person of Daniel 11:21) will endeavor to take over and to rule as his base of operations. As for us who love the Bible and its teachings, we should keep our eyes on events that will occur in the Middle East. God will soon send a spirit of grace and supplications on the people in Jerusalem and the land of Israel. Many Israelites are destined to return to the one who has been “pierced” (a reference to Christ and his crucifixion) (Zechariah 12:9–14) and they will send the idols out of the land (Zechariah 13:1–6). When one reads the text carefully, it shows that Jews, Arabs, Christians and others who live in the area will take part in this renewal of the Spirit that God will send. This will cause more of an accord to come between Israel and her Arab neighbors. And as time goes on, Israel will be able to place many Israelites coming back to the Promised Land from the north quarters of the world even into Gilead (the region east of the Jordan River). See Zechariah 10:10 where this is clearly shown. But their dominion will not stop with Gilead. An accord will be made with most of the peoples of the Middle East and increasing harmony will be seen among the peoples as we get nearer the end of the age. Indeed, the people of Iran are destined to have a strong ruler once again like Cyrus who will actually help Israel to build a new Temple in Jerusalem (Isaiah 44:21–28 and all of Isaiah 45 as well). Some very interesting times are just on the horizon to us. It is time for us who love the biblical revelation to unite with our funds and prayers that the people of the world may soon begin to understand the Gospel of Christ Jesus. It is prophesied that the blinders that have been placed on peoples’ eyes by God will soon be removed and people will begin to understand the truth of the Gospel as never before (Isaiah 29:9–24). Even the prophecies of Daniel will be made more clear to all of us as we approach the Second Advent of Christ back to this earth (Daniel 12:4, 9). This is the time for all of us who are members of the Family of God to be about our Father’s business, teaching the truths of the Gospel to the world. This is specially true of us who understand the Great Mystery revealed to Paul and others in the Ephesian and Colossian epistles. A time of opportunity is just on the horizon to us. Let us keep our interest in the Word of God, and getting the Bible back into its original design, so that the world will have an easier time knowing what the Holy Scriptures teach. All of us together have a big job to do. 5 See Dr. Martin’s article “China in Prophecy” at http://www.askelm.com/prophecy/p950701.htm.